Tonight I watched a brown-skinned man accept the Democratic nomination for the President of the United States. Yeah, I know, who didn't? More intriguing was another first that went largely unnoticed--that this was possibly the first presidential candidate ever to wear a magenta tie. Which perfectly underscores the notion that we are neither a blue nor a red America. But speaking as a homo-American, I really appreciate all the pink. Favorite line of the night: "We love this country too much to let the next four years look like the last eight...eight is enough." If he wins (fingers crossed) they will be, hands-down, the best looking First Family the US has ever had. I love all of the color coordination happening here. And the pink, absolutely love the pink! 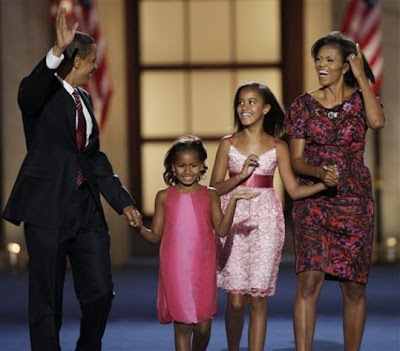 Definitely the best dressed probable First Family. I loved how his little one kept waving at herself in the camera.